Seeing this movie again for the first time in years tonight. Post-viewing UPDATE: Even better than I remembered! I never realized when I was a kid how many cameos there are in The Muppet Movie. One part made me re-think everything I know about all things Muppet. 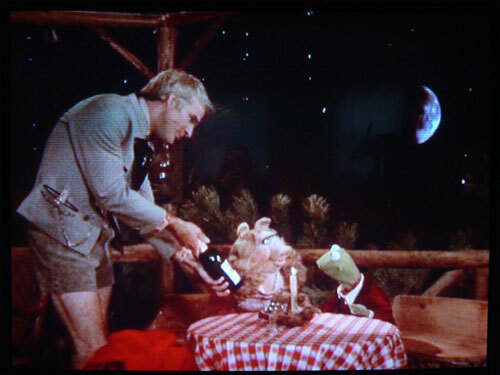 The above image is from the scene of Kermit and Piggy’s first date with a cameo by Steve Martin as a pantless and annoyed waiter. Check out the moon. Is it sky blue with white clouds? On the DVD, you can even make out earth-toned colors. I swear, it’s Earth. The Muppet Universe takes place in an alternate reality very similar to our own but with one significant difference – life exists on the moon and the Earth is a deserted planet! Who knew Jim Henson was into sci-fi and speculative fiction? It sure explains Pigs In Space.